Cover of "Angora." The cover of the album is of woven rabbit wool bore. The two Sig Runes included on the cover were the insignia of the Schutzstaffel (SS). 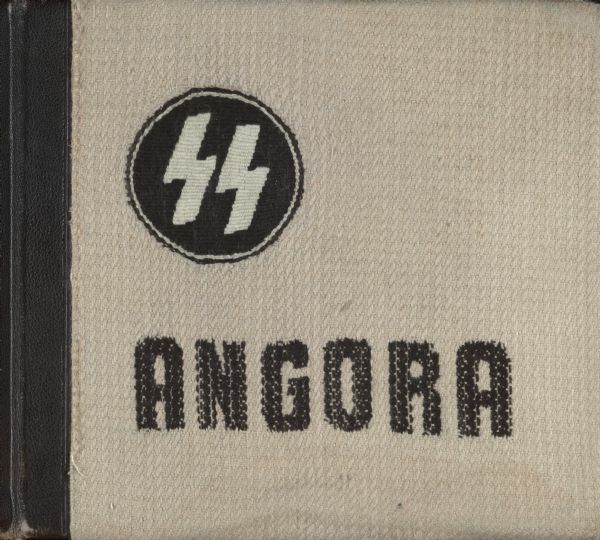 Album with approximately 150 mounted photoprints, maps, charts, and hand-lettered text, documenting the angora rabbit wool raising projects operated by the Nazi SS corps at each of the concentration camps throughout German occupied territory where the corps was in charge. Images show the rabbits, their hutches, feeding, and shearing. It also documents the preparation of their angora wool, as well as other scenes. Sigrid Schultz acquired the album in 1945, which had been hidden in a barn near Tegernsee, Germany.